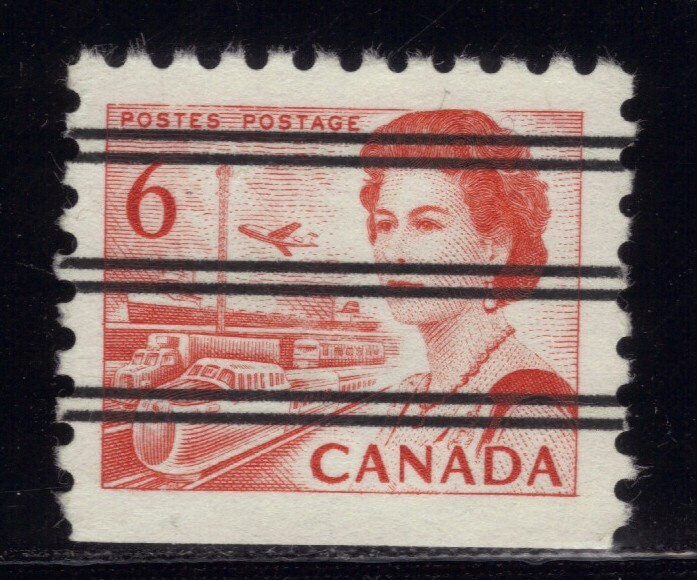 Next is the Winnipeg Tag stamps , left bar and centre bar and right bar , both front and back, you can see the tagging if you look carefully. Next is the coil stamp with a perf 9.5 horizontal ,dull fluorescence and dextrine gum. and last the Precancel stamp. unitrade number 457xx, perf 12 with dull fluorescence and dextrine gum. 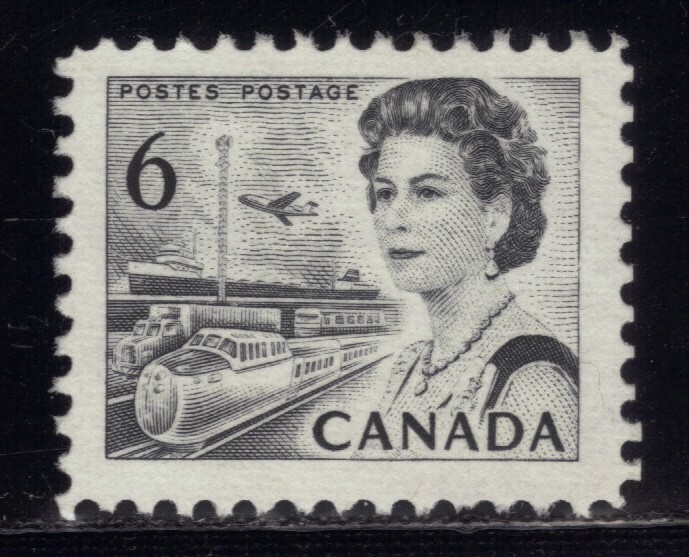 Historical Notice :A new portrait of Her Majesty the Queen Elizabeth is featured in the design of the 5¢ issue. Accompanying view respectively depicts the Atlantic Coast. 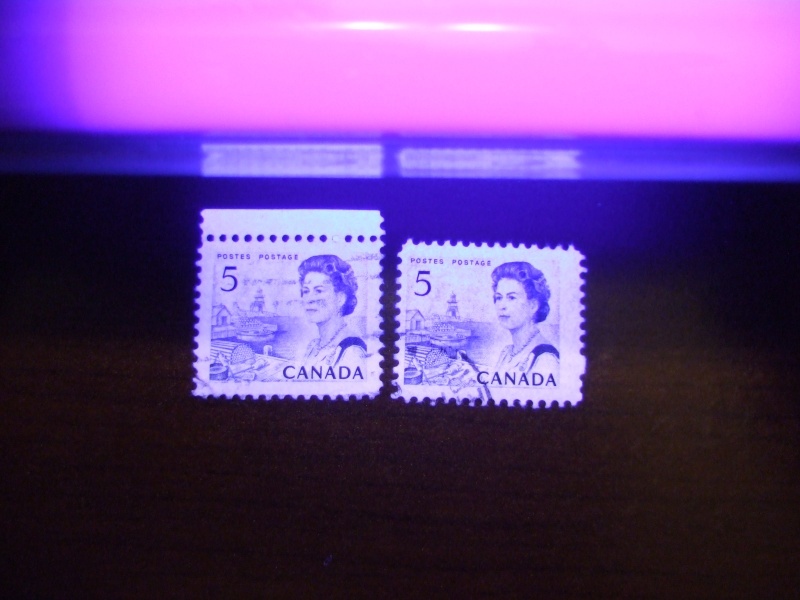 The 2 other stamps below are the Error 5 stamps with a line or bleed of color from the top of the five they are unitrade number 458vi, and have a perf 12, with dull fluorescence and dextrine gum, there is a photo to show the two examples. 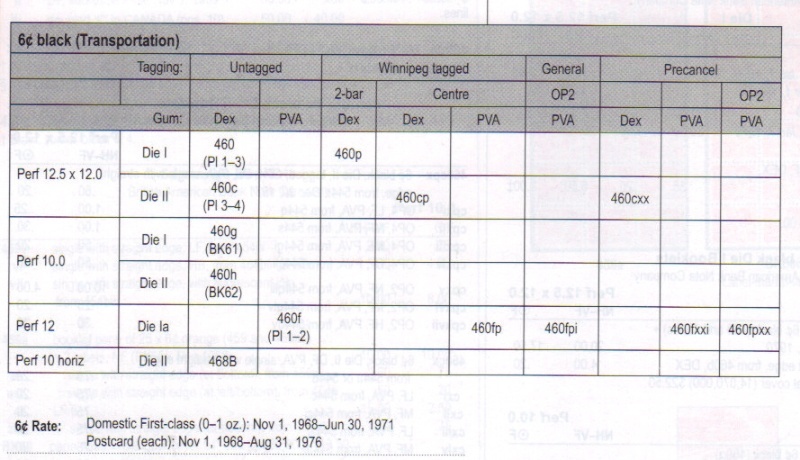 Next is the Tagging issue stamps with Winnipeg centre bar and 2 bar tag. 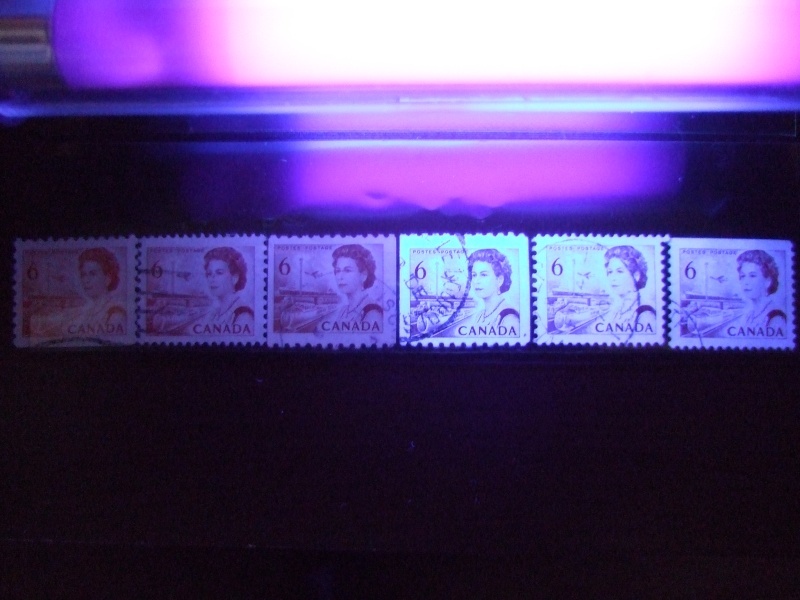 the stamps are Unitrade number 458piii with PVA gum and the other is 458p with dull fluorescence and dextrine gum.both are perf 12 and are from the Canadian Bank note company sheet . the stamps are not in order. next is the coil and precancel stamps ,the Coil is scott number 468 and has a perf 9.5 horizontal , and iss dull fluorescence with dextrine gum, the Precancel is unitrade number 458xx and is perf 12 with dull fluorescence and dextrine gum. 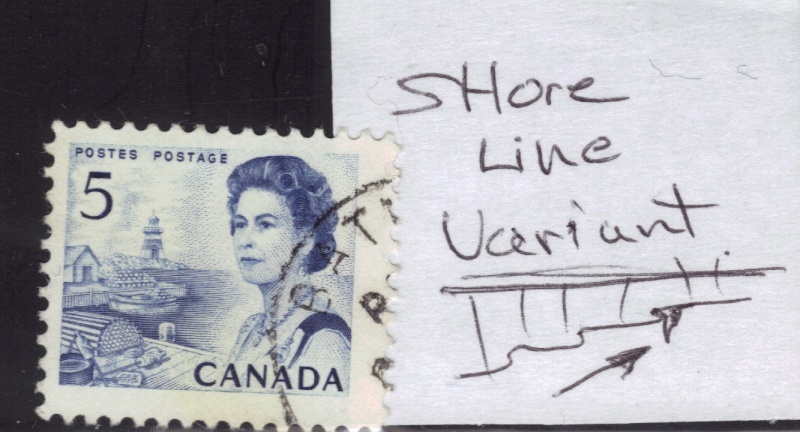 The shoreline variant is another error stamp i found. Next is the Hi-brite paper stamp the first is Hi-Brite with perf of 12 unitrade number 458iii and from the Canadian bank note company sheet .the second stamp is a speckled Fluorescence paper unitrade number 458iii as there is'nt a number for it.Its also perf 12 with Dextrine gum. see pic under the black light. 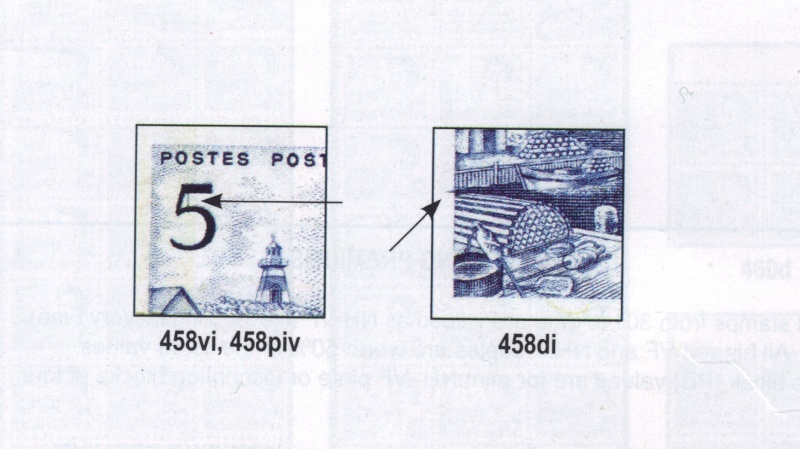 Historical Notice: The new orange coloured 6c regular issue engraved stamp, compatible with other values now in use, emphasizes the importance of transportation and communications in unifying the five major economic regions depicted on the 1c to 5c series. 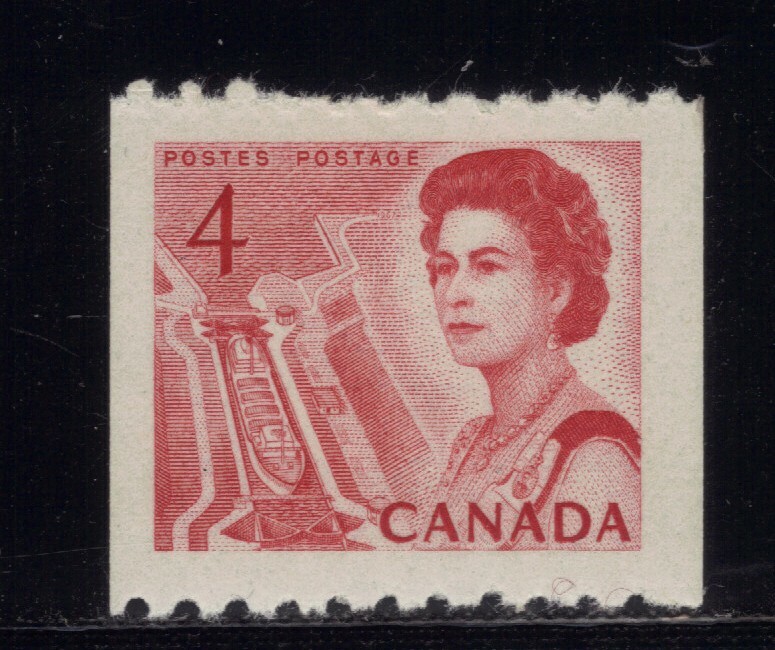 Designed by the Canadian Bank Note Company, Ottawa, the new issue has dimensions of 24 mm x 20 mm; there will be continuous printing by the British American Bank Note Company, Ottawa. Foremost in the left area segment is a modern high-speed locomotive designed for inter-urban use; highway transport is symbolized by a truck and a bus; in the background is a lake vessel, and overhead flies a medium range inter-city jet aircraft. The communications aspect is epitomized by a microwave tower, typical of a continent-spanning system supplementing land-line and cable connections. 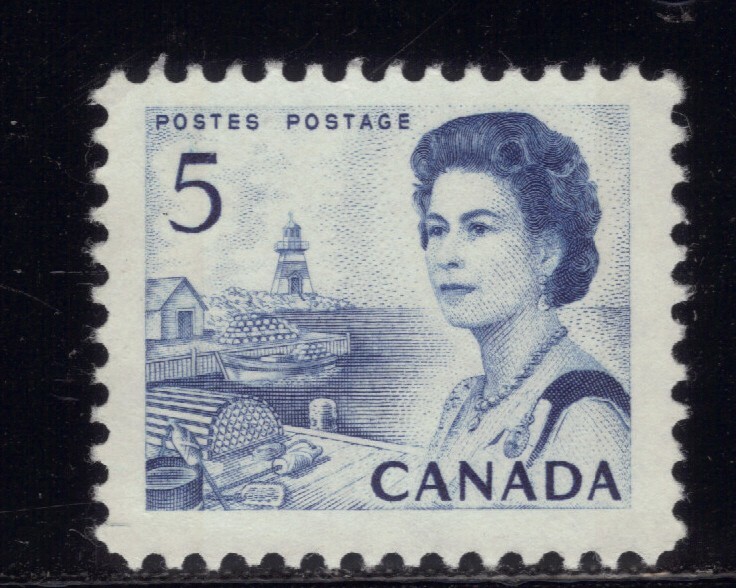 As in previous denominations in this series, a recent portrait of Queen Elizabeth, engraved from a photograph by Anthony Buckley, is incorporated in the right section of the stamp. Next is 3 stamps ,the first is a perf 10 low fluorescence British American Bank note company from a booklet stamp of 25 unitrade number 459v, next is a perf 12.5 X 12.0 dull fluorescence unitrade number 459b also British American bank note company from a sheet. Last is a Coil stamp perf 10 Horizontal unitrade number 468A dull florescence dex gum from a roll of 100. Next is a Precancel stamp ,perf 10 with dull fluorescence ,unitrade number 459xx Engraved by the British American bank note company. This stamp has dex gum. 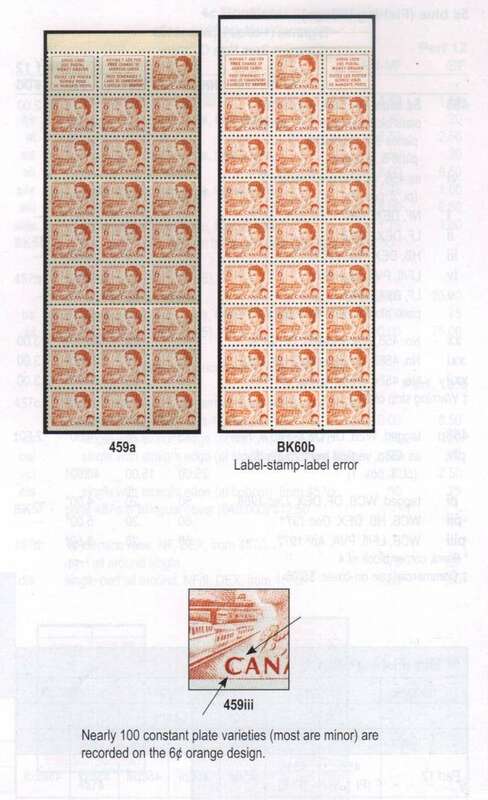 Next is a scan of one of a hundred Errors on this stamp, plus a look at the 25 strip booklets. unfortunately i dont have any yet. 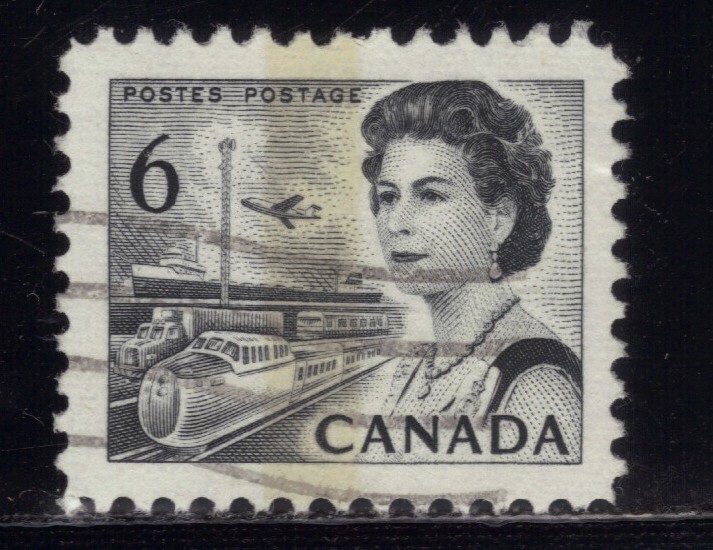 this is the train on the stamp. this is the first day cover. Next is a set of 6 cent Orange all perfs 10, 12.5 X 12, 10 coil. showing under a black light a the Hi-Brite coil and dull fluorescence on the ones next to it , and the first 3 are non fluorescence. British American bank note company with a perf of 12.5 X 12, and from a sheet with dex gum. 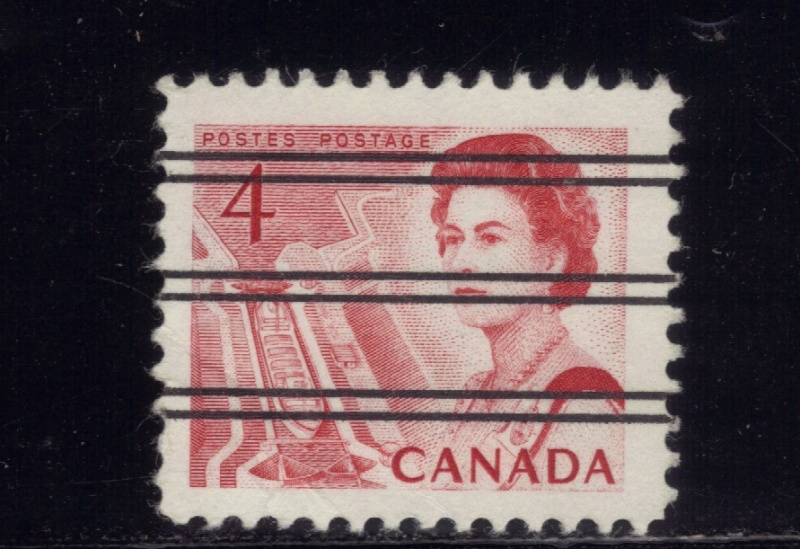 the next is a Die 1a low florescence perf 12, from the Canadian bank note company, with PVA gum , next is a Die 2 booklet stamp from the British American bank note company. with a perf 12.5 X 12 with dull fluorescence and PVA gum. These stamps had many Errors, the front headlight on the train was one of them having a third light ,i dont have any yet as i got to go threw 10,000 to find one. Next is a perf 12 Canadian Bank note company, Winnipeg centre bar tagging ,with low fluorescence horizontal RIB. from the Die 1a ,the gum is PVA. The tagging is easy to see on this stamp. Next is a scan of the 3 Dies for these stamps. and if you are looking threw them it can get confusing . Next is 3 stamp of 6 cent : the first is a Coil perf 10 scott number 468B from Die 2 with dex gum and dull fluorescence ,next is a Precancel Die 2, perf 12.5 X 12 and unitrade number 460xx , from the British bank note company, dull fluorescence and dextrine gum. next is a perf 10 booklet stamp Die 1, dull fluorescence and dextrine gum unitrade number 460a. 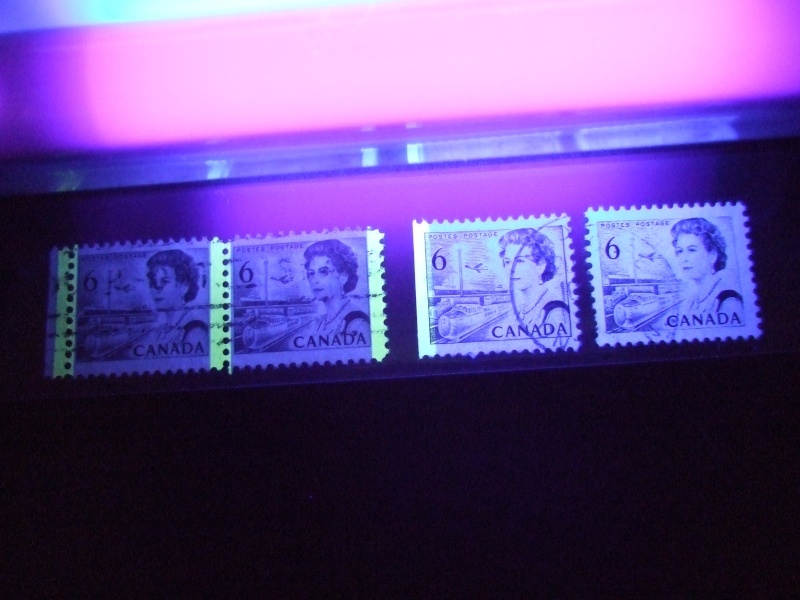 Next is 4 6 cent black stamps under a black light to show the phosphorus tagging, first pair is perf 12 from the Canadian bank note company , Die 1a tagged GT2 (4mm) non fluorescence ,with PVA gum, unitrade number 460fpi, the next is a Die 2 from the British American bank note company, perf 12.5 X 12 and OP4 tagging Error on one side ,the OP4 tags were often migratory on these stamps causing false tagging Errors, and PVA gum, and Hi Fluorescence paper ,unitrade number 460cpxiv. The last is a Die 1 perf 12.5 X 12 hi-Brite paper white Dex gum. unitrade number 460ii from the British American bank note company. 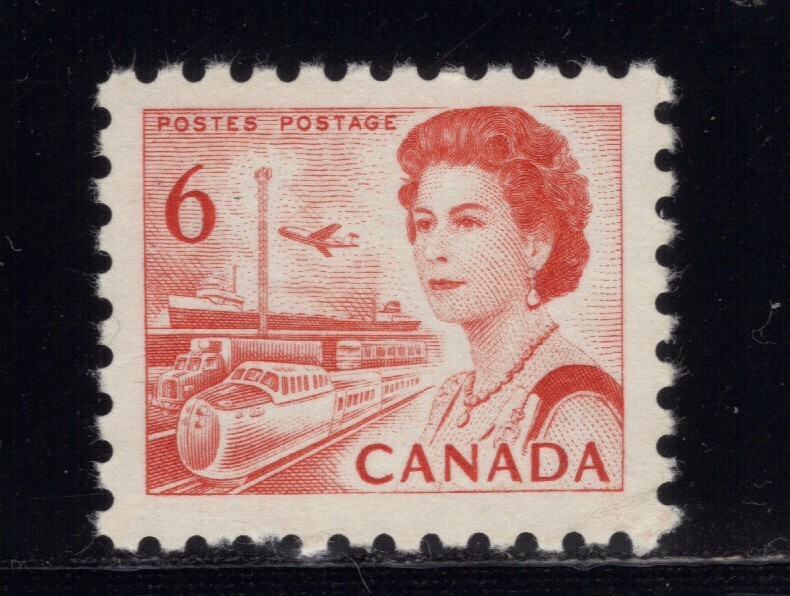 Next is a scan showing the tagging on these stamps .